Drum cable and hose reels supplied by Conductix-Wampfler were used at the Dalrymple Bay Coal Terminal. Dalrymple Bay Coal Terminal (DBCT) is one of the largest coal terminals in the world. The terminal has been progressively expanded from its commencement in 1983 to its present capacity of 85Mtpa. At the terminal huge stockpiles of coal are constantly being loaded and unloaded to fill ships with the valuable commodity. 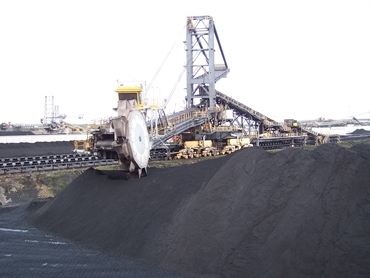 The loading and unloading of coal is performed by large and complex stacker reclaimers. These machines have significant and complex demands for 3 phase power, fibre optic transmitted control and water for dust suppression. This demand for water, power and control must be satisfied without fail, over the full 1.1 km travel of the stacker/reclaimers. The critical task of facilitating this power, control and water supply is performed by drum cable & hose reels supplied by Conductix-Wampfler.